Pull up a chair and soak in the views from the decks of these amazing cabins of the Smoky Mountains! We’ve detailed four Wears Valley cabins below that offer the perfect decks for enjoying these spectacular sights! Inside your cabin you’ll find endless amenities for your comfort and entertainment…but you and your guests will likely migrate outside often to take in the breathtaking mountain views that surround you! Peek-A-View is an affordable, luxury cabin that offers an inviting atmosphere for your stay. As you enter the cabin, you are greeted by the warmth of the great room that has floor to ceiling windows on display. This cabin in the Smoky Mountains captures scenes from nature at various angles from these impressive windows and the wrap around deck that can be accessed from the main level. Located high upon Millers Creek, this beautifully decorated and spacious two bedroom, two bath log home is the perfect destination for a getaway with friends or just a relaxing family vacation. Everyone has their own space at Cinnamon Sky, as each level offers its own bedroom and bathroom. 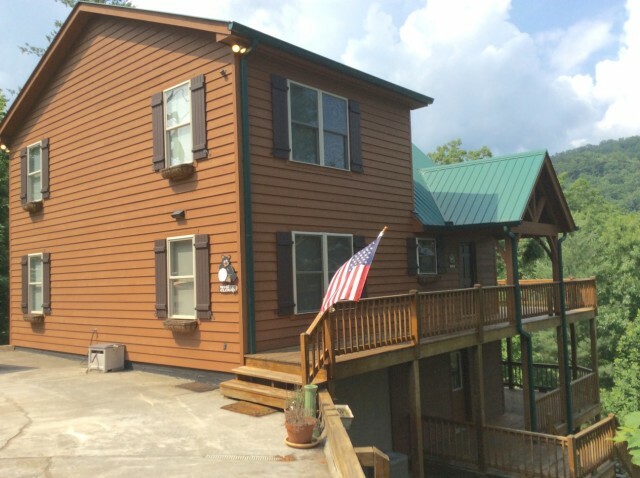 Make memories that will last a lifetime while enjoying views from one of the cabin’s decks or at the end of the custom built outdoor walkway, just minutes outside Great Smoky Mountains National Park! White Cloud offers total privacy from its prime location just outside of the National Park in Townsend. It’s only minutes from must-see Cades Cove and all that the National Park has to offer. Savor those long range mountain views from the large back deck! This Wears Valley cabin also features an open kitchen and dining area, nicely furnished bedrooms, and game room. Bring a large group along and make some mountain memories in this spacious three bedroom, three bathroom cabin! Relax and warm up after a day of exploring with a dip in the inviting hot tub on the deck, while taking in the spectacular views of the valley below! The upstairs displays great views of Wears Valley as well from its very own deck sitting area. Mountain views will surround you during your stay in Chestnut Ridge as they can be taken in from each level or bedroom. These Wears Valley cabins provide a beautiful setting for lifelong memories to be made. Our full selection of cabins in the Smoky Mountains can be found and conveniently reserved through the Great Cabins in the Smokies website. See for yourself what makes the Smoky Mountains so great this fall!